clinicians faced in the new changes of health care, she decided to seek a MMM from the USC Marshall School of Business, combining key learning from traditional MBA and MPH curriculae to prepare her for a career in ED administration and operations. 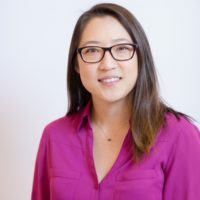 Dr. Wu’s current role as the Director of the Adult ED and full time faculty at Harbor-UCLA hones her clinical and administrative in a county hospital ED. Dr. Wu’s clinical expertise and interests are in operations, process and quality improvement, interdisciplinary team communication, airway management, critical care, and stroke. simultaneous nursing and physician assessments at triage. The Team Triage project was awarded Los Angeles County’s high recognition, the Golden Eagle Award, as well as the Mega Million Dollar Award in the LAC 31st Annual Productivity and Quality Awards in 2017, for the most innovative and money saving quality improvement project across the entire Los Angeles County. Dr. Wu has also previously worked as the subject matter expert for the implementation of the electronic health record for LAC Department of Health Services (DHS), the Online Real-time Centralized Health Information Database (ORCHID), and remains involved in optimizing the program.